The Full Moon is Saturday, November 4. Jupiter is lost in the twilight. Mercury climbs higher in the evening twilight and meets delta Scorpii on the 7th. Saturn is visible in the early evening in the heart of the Milky Way. 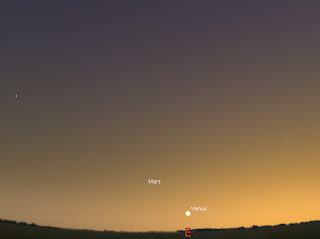 Venus is now very low in the morning twilight while Mars rises higher. The Full Moon is Saturday, November 4. The Moon is at perigee, when it is closest to Earth, on the 6th. Evening sky on Tuesday November 7looking north-west as seen from Adelaide at 20:36 ACDST (45 minutes after sunset). Mercury is low above the horizon close to the star delta Scorpii. 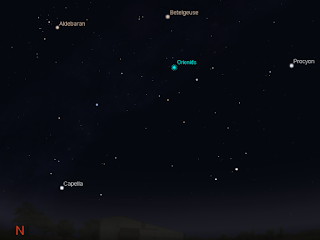 Similar views will be seen elsewhere in Australia at the equivalent local time (45 minutes after sunset). (click to embiggen). Mercury is setting in early evening and is above the western horizon in the twilight. Mercury is becoming more prominent, and is well worth watching as it rises into the evening sky, heading towards the head of Scorpius the scorpion. On the 7th, Mercury is close to the moderately bright star delta Scorpii in the head of the scorpion. Thi is the first of an interesting series of encounters over the coming weeks. Evening sky on Saturday November 4 looking west as seen from Adelaide at 21:22 ACDST, 90 minutes after sunset. Similar views will be seen elsewhere in Australia at the equivalent local time. (90 minutes after sunset, click to embiggen). Saturn is visible in the early evening setting around 11:00 pm local time. Saturn is has a very limited window as a telescopic target from 9:30 pm daylight saving time until around 10:00 pm daylight saving time. 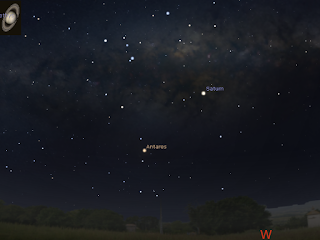 Although reasonably high in the early evening sky, Saturn continues to sink into the western evening skies as the week progresses. Saturn's rings are visible even in small telescopes and are always good to view. 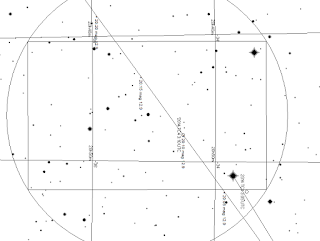 The constellation of Scorpio is a good guide to locating Saturn. The distinctive curl of Scorpio is easy to see above the north-western horizon, locate the bright red star, Antares, and the look to the left of that and slightly above, the next bright object is Saturn. Morning sky on Saturday November 4 looking east as seen from Adelaide at 5:44 ACDST (30 minutes before sunrise). Venus is bright just above the horizon and forms a line with Mars. Venus is lowering in the morning sky. This week Venus forms a line with Mars. It is becoming much harder to see Venus in the twilight, and you will need a clear unobstructed horizon to see the Venus low in the twilight. Mars is climbing higher the twilight, and is now reasonably visible in the twilight. Single image, 1/80th second ASA 800, Canon IXUS, infinity to infinity focussing, 10 mm eyepiece on 8" Newtonian with tracking. Click to emgiggen 5 images taken as the first, then stacked in RegiStax 6. Not a marked improvement (click to embiggen). Ptolemaeus, Alphonsus and Alpertragus are the three prominent caters just right of the centre. The straight wall at bottom right is ... straight wall. After an afternoon of cloudthe skies finally cleared for International Observe the Moon Night. I set up my 4" adn 8" Newtonians for observing, but no one wanted to join me (SmallestOne and his mate were exhausted for bike adventures and MiddleOne was out partying after School finishing). The Moon was in an excellent position high above the horizon, which made locking on to them with Newtonians a pain (inbvolved lots of kneeling/lying on the ground, squinting then trying to reach to scope controls with tiny science arms. After joing my family for obligatory family TV, I tried some astrophography, using my new(ish) Mobile Phone with lens combinatiosn i hadn't tried before (I typically use the 20 mm Lens and point a mobile phome through it is rather easy), I alo used a mode high power lens for my workhorse, the Canon IXUS. Bdidn't use the webcam beciuase it took too ong to set up the laptop. Anyway, with fairly simple cameras I think I managed halfway decent images for the night (I also looked though the scopes with my very own eyes, magnificent). The Moon is accessible to people with even very basic equipment. Often we get fixated on the nebula and clusters, and forget the joys of our humble, nearest companion. But even as a jaded astrophotographer, the Moon is still a delight. First Quarter Moon as seen from Adelaide looking Northwest at 21:00 ACDST, similar views will be seen for other parts of Australia at the equivalent local time. Click to embiggen. Saturday 28 October is International Observe the Moon Night. An international initiative to get people out and observe our beautiful nearest neighbour. You don't need much, just your unaided eyes, but even binoculars or a small telescope will greatly aid your appreciation of our Moon. 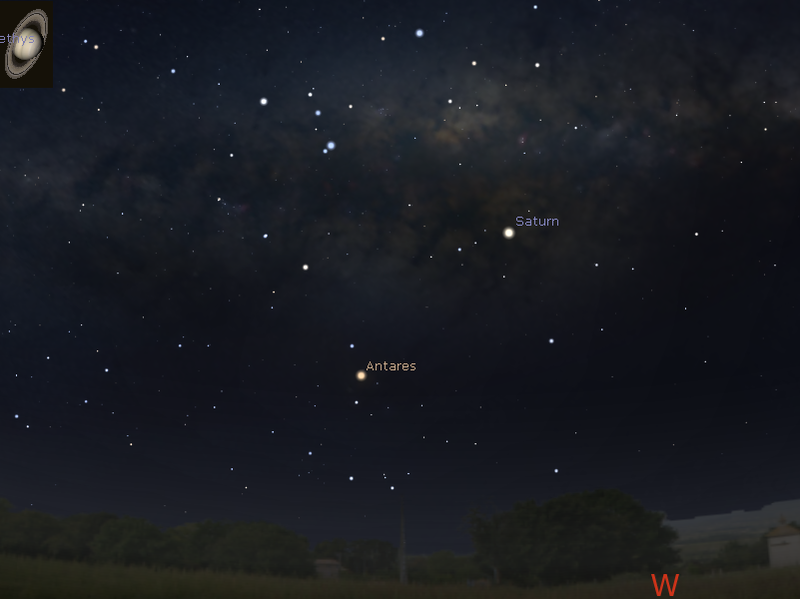 This weekend the First quarte Moon is above the North-west horizon forming a triangle with the planet Saturn and the bright star Altair. Last quarter is a good phase as the terminator, the light dark boundary on the Moons surface, is close to may interesting craters that are at their best at this sun angle. 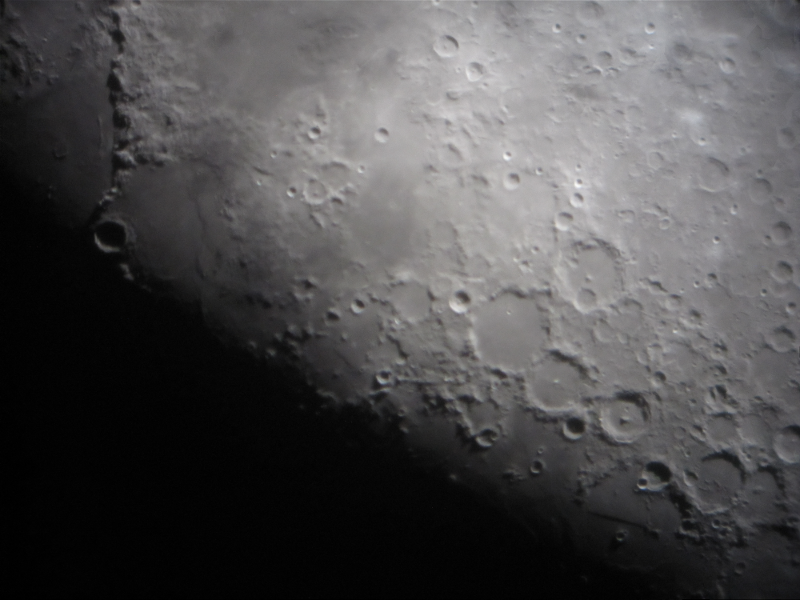 A telescopic simulation of the appearance of the Moon at 21:00 ACST, several prominent craters are visible, particularly prominent are the trio of Ptolemaeus, Alphonsus and Alpertragus (near the centre on the image here). Click to embiggen. Even with modest binocular craters can be seen along the Moons terminator. A small telescope reveals a welath of detail, and finding an focussing on the Moon is so much earier than any other class of astronomical object. Even if you don't have a telescope, just go out and look the the north-west, the view will be lovely. Around 21:00 you may even see an international space station pass. If you don't have a telescope, a local astronomical club may be having an International Observe the Moon Night near you. Check out this map for locations. So if the sky is clear, go out and have a look! The First Quarter Moon is Saturday, October 28. Jupiter is lost in the twilight. Mercury climbs higher in the evening twilight. Saturn is visible in the early evening in the heart of the Milky Way. 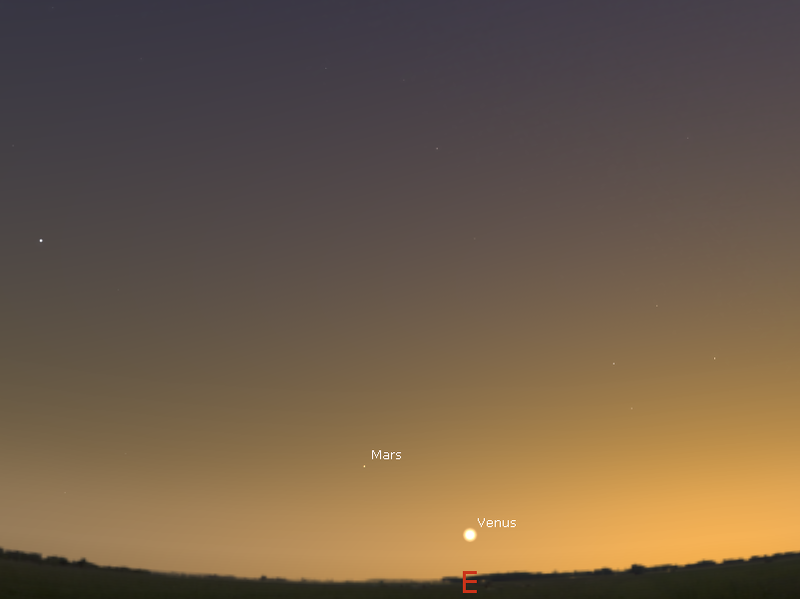 Venus is now very low in the morning twilight while Mars rises higher. The First Quarter Moon is Saturday, October 28. Evening sky on Saturday October 28 looking north-west as seen from Adelaide at 20:08 ACDST (30 minutes after sunset). Mercury is low above the horizon in the twilight. Mercury is setting in early evening and is above the western horizon in the twilight. Mercury is becoming more prominent, but you will need a clear level horizon to see it at its best. Evening sky on Saturday October 28 looking west as seen from Adelaide at 21:13 ACDST, 90 minutes after sunset. Saturn was at opposition on June the 15th, when it was biggest and brightest in the sky as seen from earth. Saturn is visible form most of the evning evening setting around 11:30 pm local time. Saturn is a good telescopic target from 9:00 pm daylight saving time until around 10:00 pm daylight saving time. It is poised next to the dark rifts in the Milky Way and is in a good area for binocular hunting. 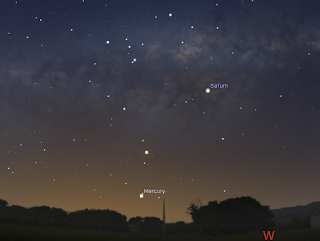 Although still high in the early evening sky, Saturn continues to sink into the western evening skies as the week progresses. Saturn's rings are visible even in small telescopes and are always good to view. . Morning sky on Saturday October 28 looking east as seen from Adelaide at 5:51 ACDST (30 minutes before sunrise). Venus is bright just above the horizon and forms a line with Mars. Venus is lowering in the morning sky. This week Venus forms a line with Mars. 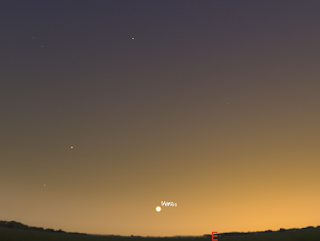 It is becoming much harder to see Venus in the early twilight, and you will need a clear unobstructed horizon to see the Venus low in the twilight. Mars is climbing higher the twilight, and is now reasonably visible in the twilight. It is still seen best from a flat, clear horizon though. 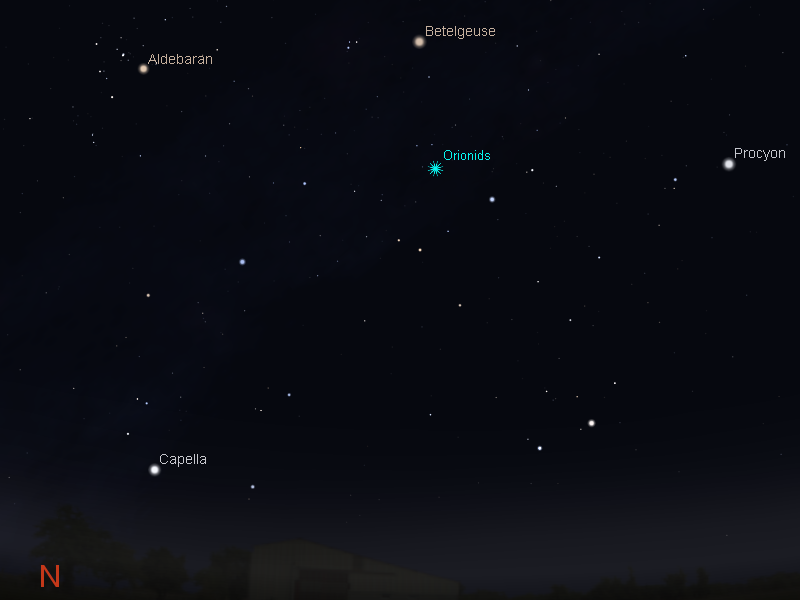 Morning sky as seen from Adelaide facing north-east at 4:00 am ACDST on 22 October, the Orionid radiant is indicated with a starburst. Similar views will be seen elsewhere in Australia at an equivalent local time. Click to embiggen. The Orionids are a worthwhile shower that somewhat favours the Southern Hemisphere,best seen between 2-5 am, the radiant, the point where meteors appear to originate from, being just under Betelgueuse, the bright red star in Orion. This year the sky is nicely dark for the shower. You can find out the predicted rates for your location using the NASA meteor flux estimator (use 8 Orionids and make sure you set the dates to 21-22 October 2017). The following table show the predicted peak rates at around 5 am local time on the mornings of the 21st, 22nd and 23rd of October for a number of cities under dark sky conditions. Rates will be similar at the same latitude as these cities, and rates will be intermediate at spots between these cities. The New Moon is Friday, October 20. Jupiter is lost in the twilight. 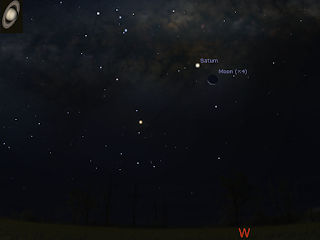 Mercury returns low in the evening twilight, and is near the Moon on the 21st. Saturn is visible most of the evening in the heart of the Milky Way. Saturn is visited by the Moon on the 24th . 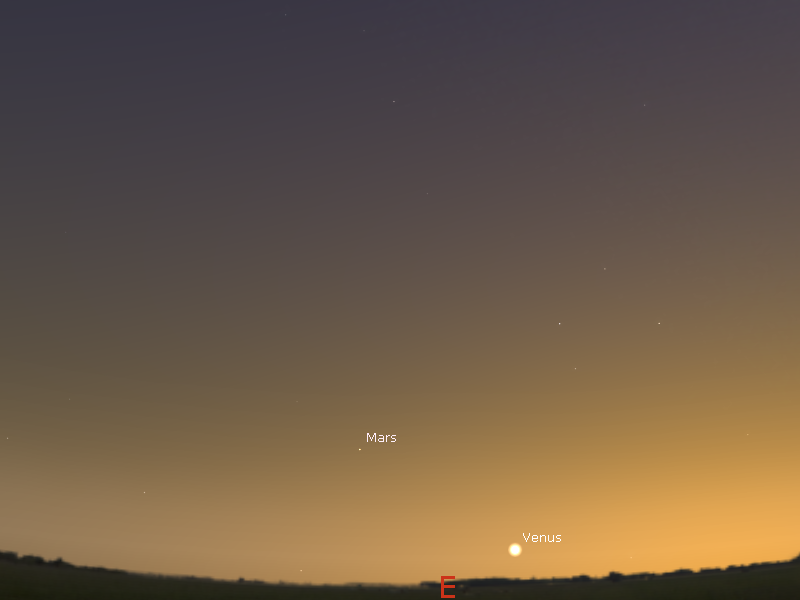 Venus is now very low in the morning twilight while Mars rises higher. Orionid meteor shower peaks on the mornings of the 21st and 22nd. The New Moon is Friday, October 20. The moon is at apogee, when it is furthest from the Earth, on the 25th. Evening sky on Saturday October 21 looking north-west as seen from Adelaide at 20:01 ACDST (30 minutes after sunset). 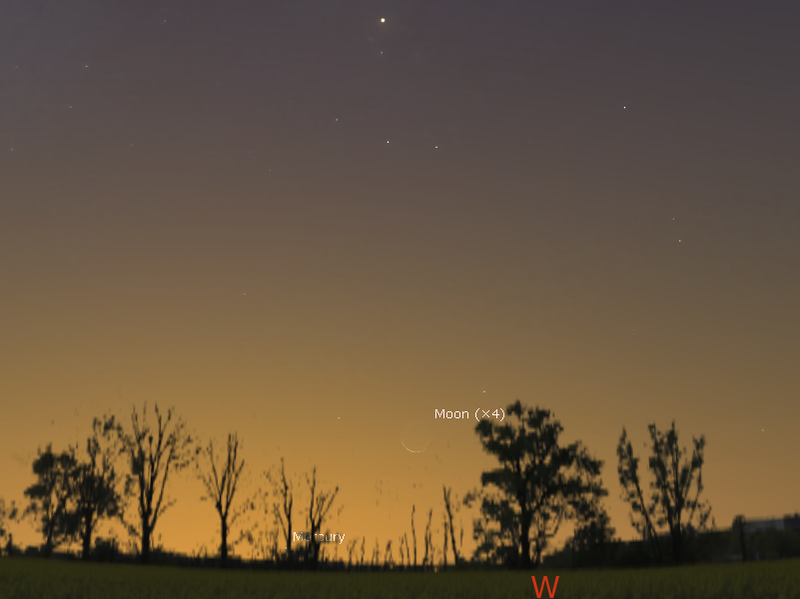 Mercury is very low above the horizon in the twilight with the thin crescent Moon nearby. 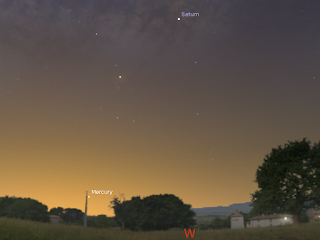 Mercury is setting in early evening and is above the western horizon in the twilight. You will need a clear level horizon to see it, although by the end of the week it is more prominent. On the 21st the thin crescent Moon is near mercury. Evening sky on Tuesday October 24 looking west as seen from Adelaide at 21:05 ACDST, 90 minutes after sunset. Saturn was at opposition on June the 15th, when it was biggest and brightest in the sky as seen from earth. Saturn is visible all evening long. Saturn is a good telescopic target from 9:00 pm daylight saving time until around 9:30 pm daylight saving time. It is poised next to the dark rifts in the Milky Way and is in a good area for binocular hunting. 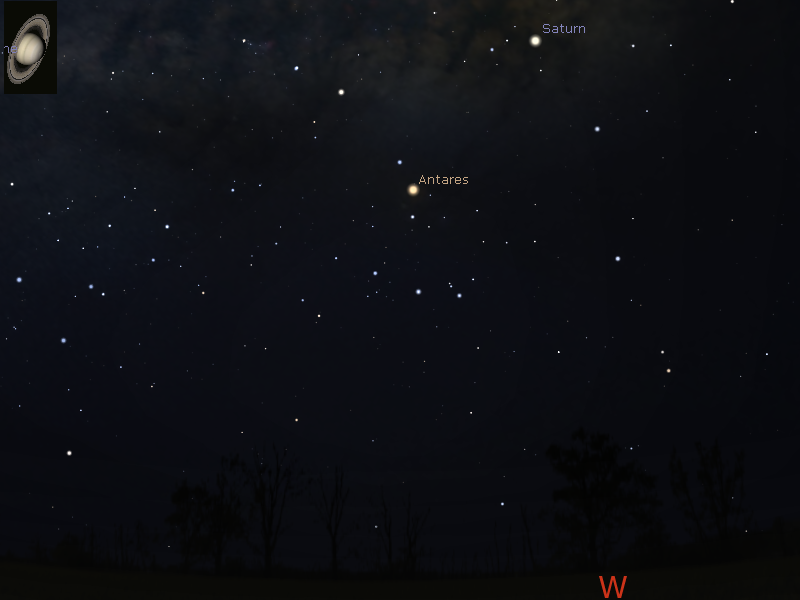 Although still high in the early evening sky, Saturn begins to sink into the western evening skies as the week progresses. Saturn's rings are visible even in small telescopes and are always good to view. 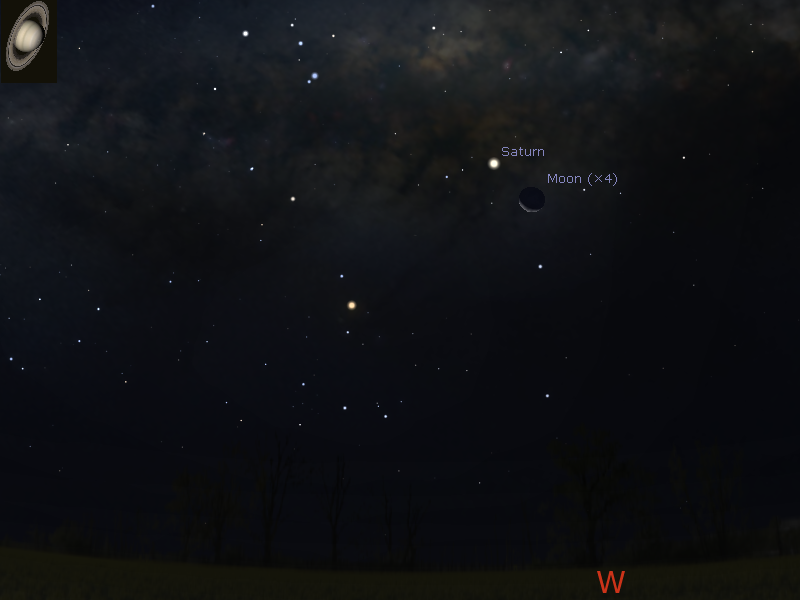 Saturn is close to the crescent Moon on the 24th. Morning sky on Saturday October 21 looking east as seen from Adelaide at 6:00 ACDST (30 minutes before sunrise). Venus is bright just above the horizon and forms a line with Mars. Venus is lowering in the morning sky. This week Venus forms a line with Mars. It is becoming much harder to see Venus in the early twilight, and you will need a clear unobstructed horizon to see the pair low in the twilight. Mars is climbing higher the twilight, but sound be reasonably visible this week. 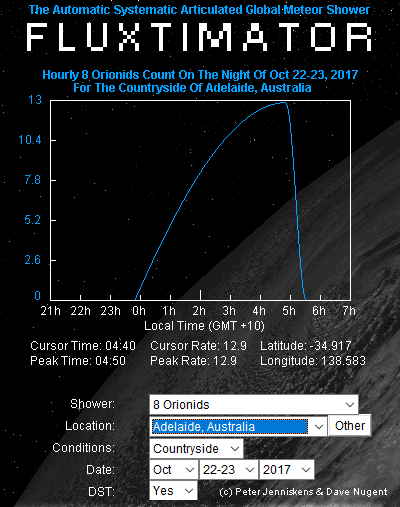 The location of the Orionid meteor radiant (starburst) as seen looking north-east at 3:00 am October 23 local daylight saving time from Adelaide. Similar views will be seen at equivalent local times elsewhere. The Orionid Meteor shower peaks on October 21 in Australia, the radiant for the Orionids rises around 2 am on October 22, with the best meteor viewing being between 3:00 am and 4:00 am. You can expect to see roughly a meteor every 5 minutes or so under dark skies. You can use the Meteor Flux Estimator to predict the number of meteors you might see at your location. Choose 8 Orionids, and make sure the date is 2017 and you have DST on if you are in daylight saving zones. The SWS has issued a geomagnetic warning and aurora watch for 14 October (UT) due to expected arrival of a solar wind stream from a coronal hole. This is expected to arrive early in the UT day on the 14th (which is the evening of the 14th Australian time). The SWS predicts active to minor storm conditions. The Space Weather Prediction Service has Predicted a G1 storm on the early evening of 14 October and there was a minor geomagnetic storm in the daylight hours earlier. If these geomagnetic events occur and result in aurora they could be seen from Tasmania weather permitting. The Moon is past last quarter and will not significantly interfere with aurora. Be patient, as the activity may rise and fall of the magnetic polarity of the wind may fluctuate significantly. This event is unlikely to be as spectacular as those in September, but still worth a look. As always look to the south for shifting red/green glows, beams have been reported consistently over the last few aurora, as well as bright proton arcs and "picket fences". A double arc, blobs, and curtains were seen in Septembers aurora despite the moonlight. The previous geomagnetic warning is extended for one more day. nighttime hours from southernmost Australian regions. 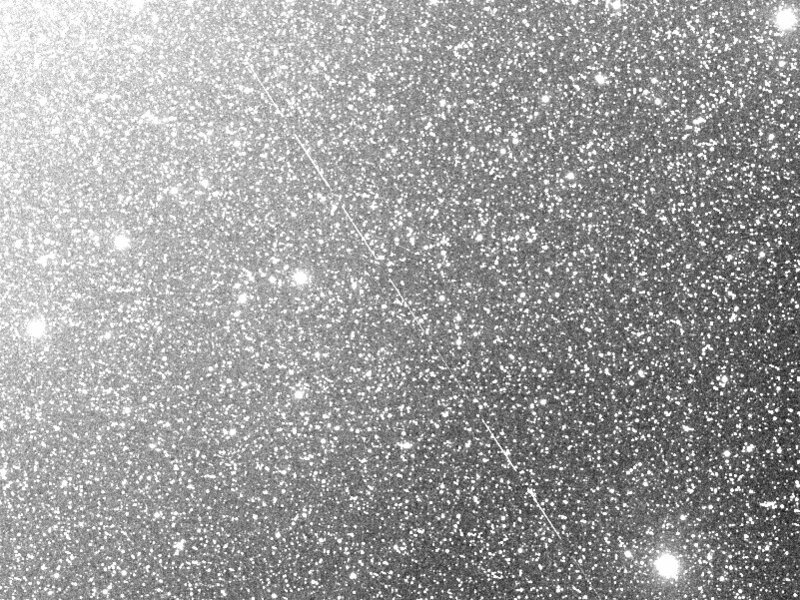 Asteroid 2012 TC4 imaged with iTelescope T20 on 11 October 2017. MAX stack of 8 x 60 second luminance images, stacked in ImageJ. Over enhanced to show the asteroid. Click to embiggen. Animation of all 8 frames, made with ImageJ. CLick to embiggen. Five years ago to the day, NEO 2012 TC4 passed 0.2 Earth Moon distances away from us. This time the asteroid was even closer, at 0.13 Earth Moon distances (a mere 50,150 km) and hurtling though the sky at a blistering 13 arc minutes a second. At this speed the iTelescopes cannot track the asteroid. Even with a 60 second exposure the asteroid is a mere streak 45 minutes before closest approach. 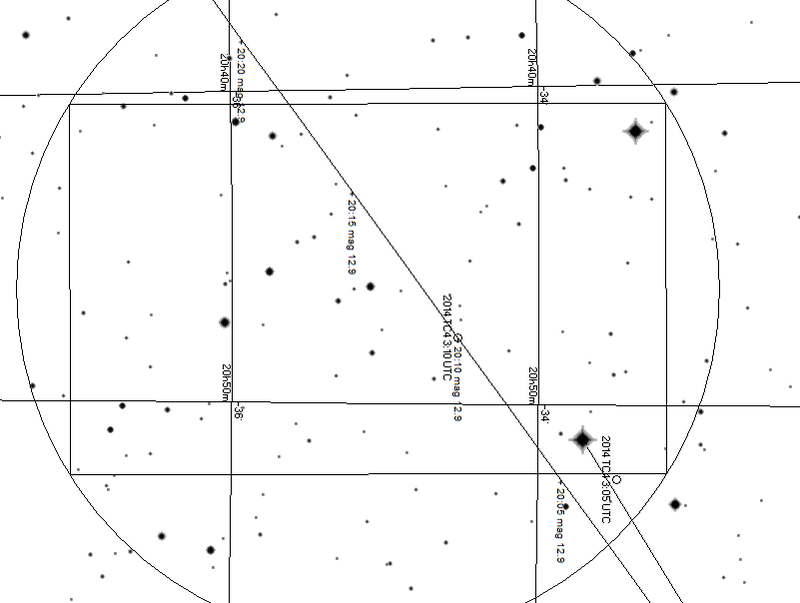 I managed to capture it by camping out where the Minor Planet Ephemeris center predicted it would be and waiting until the time it would be predicted to pass across the field of view before imaging. The asteroid zipped across the field in a mere 12 minutes. The asteroid is a fast rotator, with a period of 12 minutes and 14 seconds, and the asteroid can be seen to dim midfield. 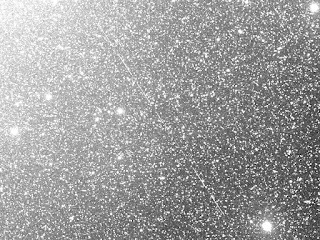 There are quite a few good images of the asteroid on the web, like this one from the SONEAR observatory. The Last Quarter Moon is Thursday, October 12. Jupiter is low in the twilight sky. Saturn is visible most of the evening in the heart of the Milky Way. 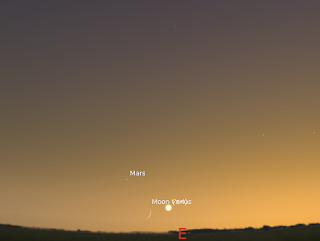 Venus is now very low in the morning twilight and forms a line with the crescent Moon and Mars on the 18th. 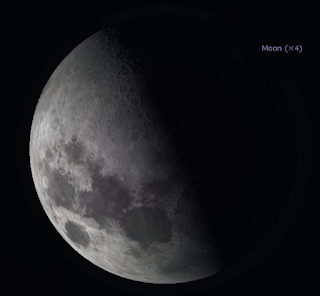 The Last Quarter Moon is Thursday, October 12. Evening sky on Saturday October 14 looking north-west as seen from Adelaide at 19:55 ACDST (30 minutes after sunset). Jupiter is very low above the horizon, deep in the twilight. 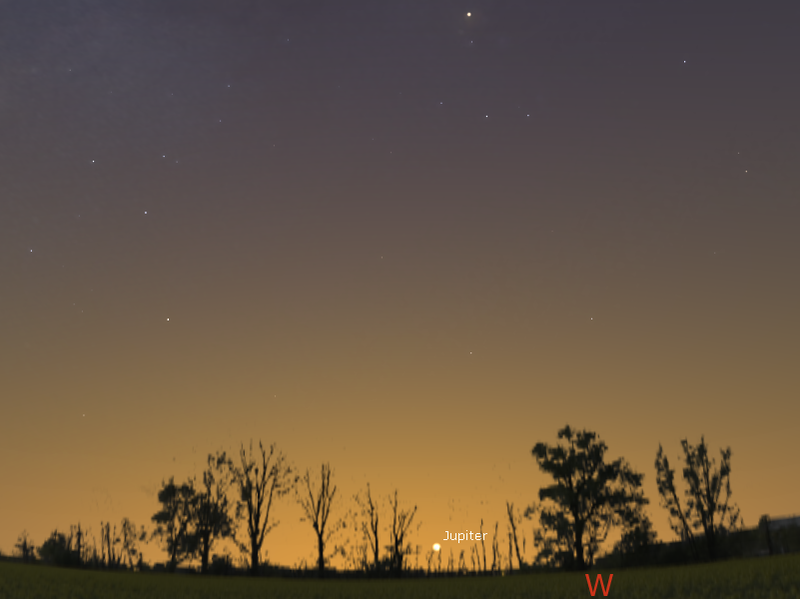 Jupiter is setting early evening and is above the western horizon in the twilight. You will need a clear level horizon to see it. Opposition, when Jupiter is biggest and brightest as seen from Earth, was on April the 8th. 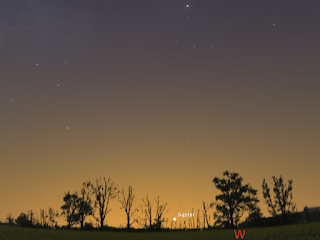 Jupiter sets around 8:13 pm local daylight saving time. Jupiter is now too low to be a good telescopic target. Evening sky on Saturday October 7 looking west as seen from Adelaide at 20:55 ACDST, 90 minutes after sunset. Saturn was at opposition on June the 15th, when it was biggest and brightest in the sky as seen from earth. Saturn is visible all evening long. Saturn is a good telescopic target from 9:00 pm daylight saving time until around 11 pm daylight saving time. It is poised next to the dark rifts in the Milky Way and is in a good area for binocular hunting. 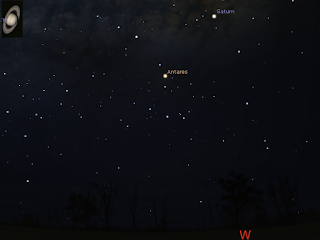 Although still high in the early evening sky, Saturn begins to sink into the western evening skies as the week progresses. Saturn's rings are visible even in small telescopes and are always good to view. Morning sky on Wednesday October 18 looking east as seen from Adelaide at 6:09 ACDST (30 minutes before sunrise). Venus is bright just above the horizon and forms a line with the thin crescent Moon and Mars. Venus is lowering in the morning sky. This week Venus forms a line with the thin crescent Moon and Mars. It is becoming hard to see Venus in the early twilight, and you will need a clear unobstructed horizon to see the lineup low in the twilight. 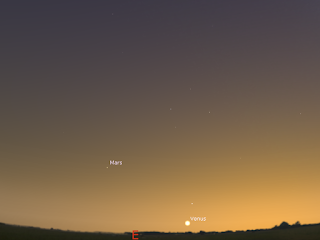 Mars is climbing higher the twilight, but sound be reasonably (just) visible this week. Southern Skywatch October 2017 edition is now out! Morning sky as seen on September 18 half an hour before sunrise. 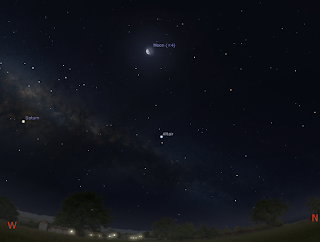 The crescent Moon is close to Venus and forms a triangle with Mars. Similar views will be seen elsewhere in Australia at the equivalent local time. (click to embiggen). The October edition of Southern Skywatch is now up. Sorry this is late again, but I was up in QLD with dodgy internet celebrating mum's 95th Birthday. This month Mars climbs higher in the morniing sky and is close to Venus. 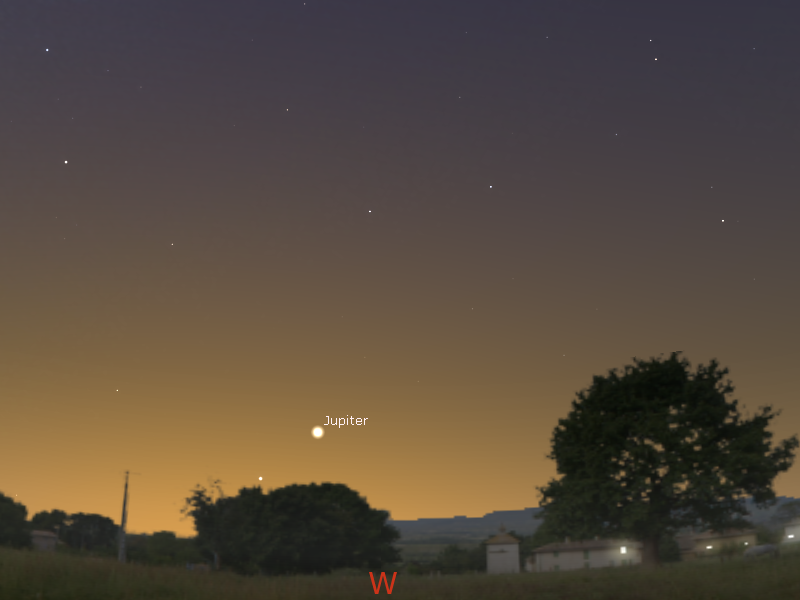 Jupiter comes closer to the western horizon and it is lost to view by the end of the month. 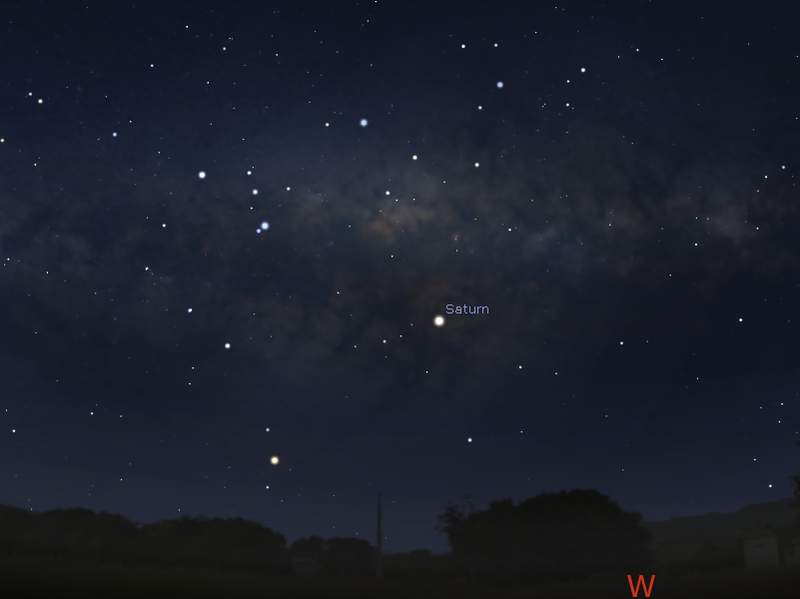 Saturn is still high in the early evening sky this month. This is still a good time to watch this ringed world in a telescope, although the window of good observation is narrowing. On the 24th Saturn is close to the crescent Moon. Mercury enters the evening sky late this month but is very difficult to see low on the horizon. Next Month it will be very good viewing. 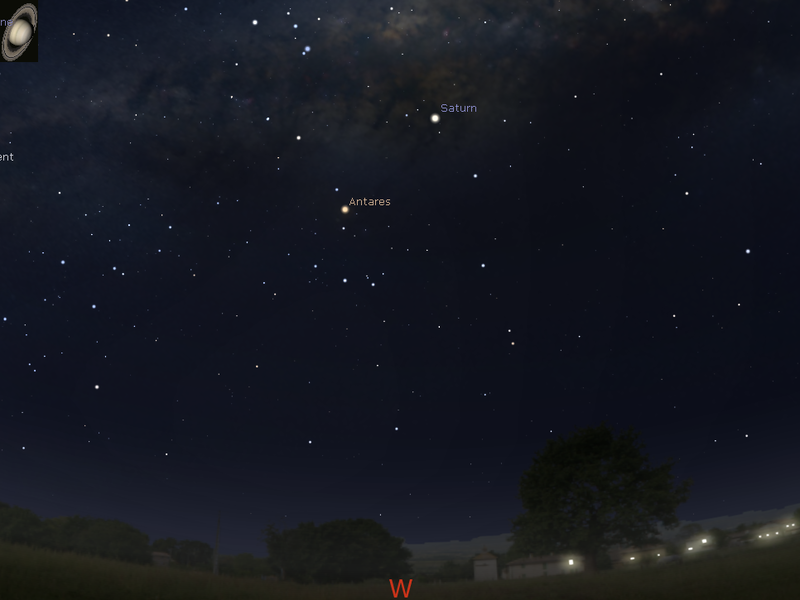 Venus gets lower in the morning sky this month. 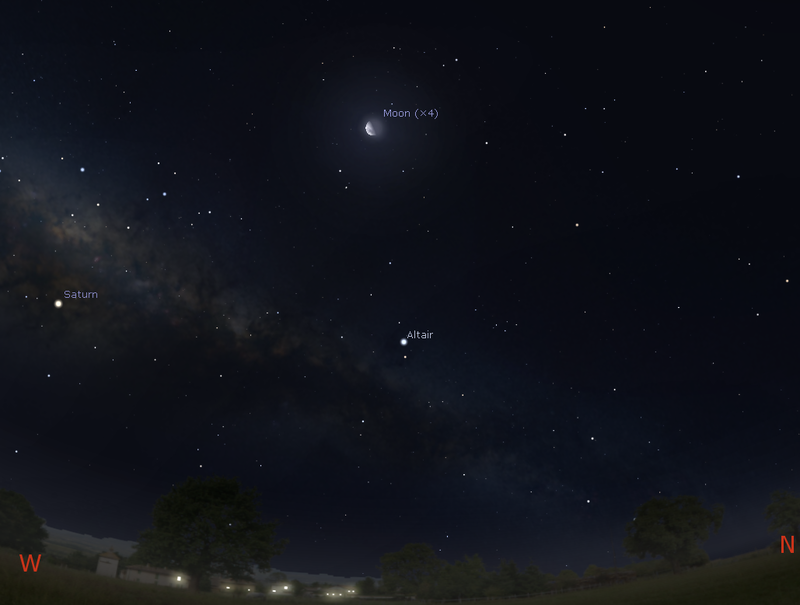 The crescent Moon is close to Venus on the 18th, forming a triangle with Mars. Venus is also lost to view by the end of the month. The Orionid meteor shower is active towards the end of the month, with the best rates in the early morning of the 21st and 22nd. Astrophiz Podcast 44 (Galaxy Detective edition) is Out! Astrophiz Podcast 44 is out now. To understand how galaxies evolve, Dr Rebecca Allen uses Hubble and Keck images to study star-forming galaxies and galaxies that are not forming stars. Rebecca’s passion for both outreach and research makes for a exceptional episode as she paints a clear picture of galactic evolution to help us understand some of the fundamental elements of our cosmos. For observers and astrophotographers, I continue with ‘What’s Up Doc’ and tells you when, where and what to look for in morning and evening skies. In Ian’s Tangent, I helps you understand more about the new discovery of Binary Comets. The discovery of the 4th Gravitational Wave announced as a result of a collaboration between researchers at the Italian GW facility and the LIGO detector. The 2017 Nobel Prize for Physics awarded to 3 men (out of the hundreds of) researchers who created LIGO and the first GW detection. Dame Jocelyn Bell Burnett still not recognised by the Nobel Committee for her discovery and analysis of Pulsars. That honour was snagged by the bloke who ‘supervised ’her research. The Full Moon is Friday October 6 the last Quarter Moon is Thursday, October 12. Jupiter and the bright star Spica are nearby in the early twilight sky. Saturn is visible all evening in the heart of the Milky Way. 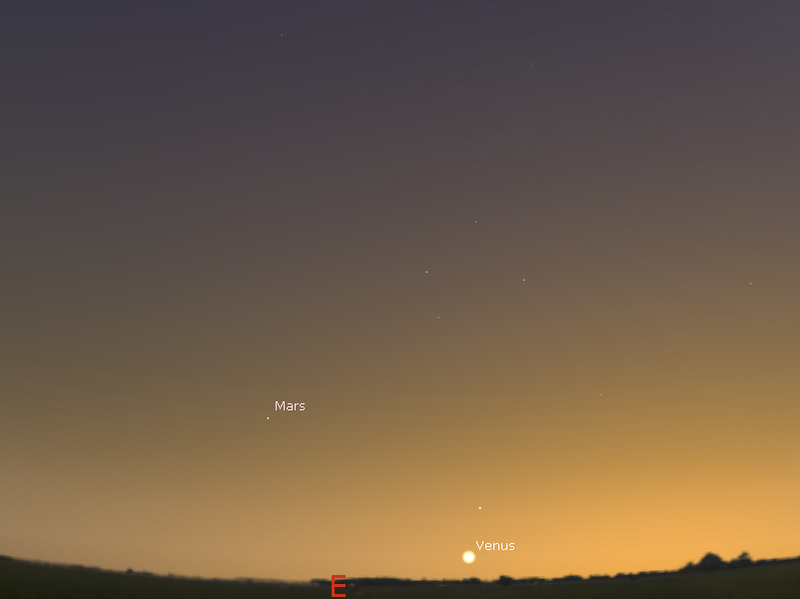 Venus is now low in the morning twilight and is very close to Mars on the 6th. The Full Moon is Friday October 6 the last Quarter Moon is Thursday, October 12. The Moon is at perigee, closest to the Earth on the 9th. Evening sky on Saturday October 7 looking north-west as seen from Adelaide at 19:49 ACDST (30 minutes after sunset). Jupiter is low above the horizon near the bright star Spica. Jupiter is setting early evening and is above the western horizon in the twilight. It is close to the bright star Spica, the brightest star in the constellation of Virgo. Over the week Jupiter moves away from Spica. Opposition, when Jupiter is biggest and brightest as seen from Earth, was on April the 8th. Jupiter sets around 8:30 pm local daylight saving time. Jupiter is now too low to be a good telescopic target. Evening sky on Saturday October 7 looking west as seen from Adelaide at 20:50 ACDST, 90 minutes after sunset. Saturn was at opposition on June the 15th, when it was biggest and brightest in the sky as seen from earth. Saturn is visible all evening long. Saturn is a good telescopic target from 9:00 pm daylight saving time until midnight. It is poised above the dark rifts in the Milky Way and is in a good area for binocular hunting. 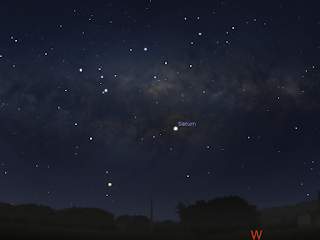 Although still high in the early evening sky, Saturn begins to sink into the western evening skies as the week progresses. Saturn's rings are visible even in small telescopes and are always good to view. Morning sky on Friday October 6 looking east as seen from Adelaide at 6:19 ACDST (30 minutes before sunrise). Venus is bright just above the horizon and is extremely close to Mars. Venus is lowering in the morning sky. 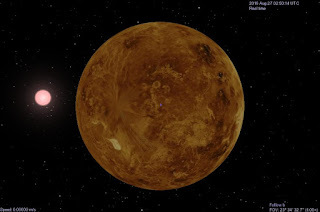 This week Venus comes close to Mars. It is becoming hard to see Venus in the early twilight, but it is still brilliant enough to be obvious shortly before sunrise. 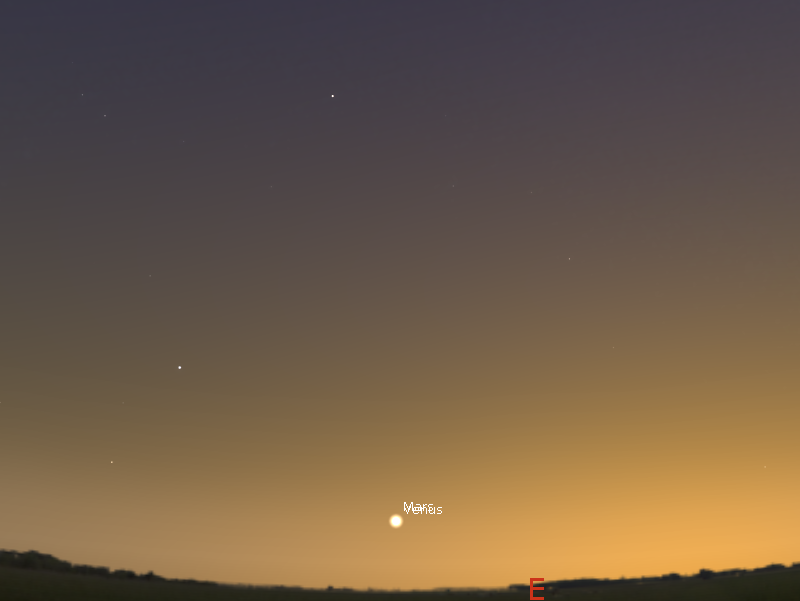 Over the Week Venus comes closer to the planet Mars, but you will probably need binoculars to pick up Mars in the twilight. The pair are closest on the 6th, when they are less than half a finger-width apart, they will look good in binoculars, or a small etelscope if you can get it to point that low to the horizon. Mars is still emerging from the twilight, but will be difficult to see for some time. It may be more readily visible by the end of the week.